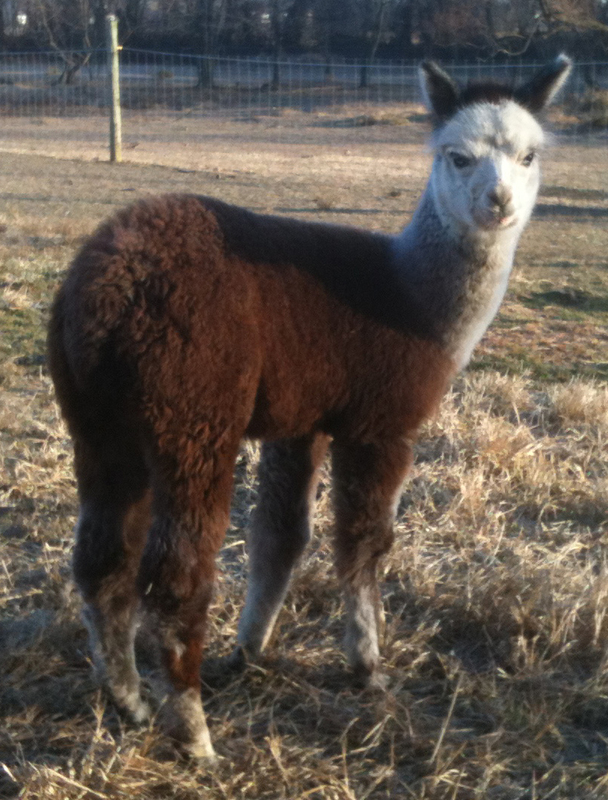 We are always excited when the first cria of the year is a girl. And this one was just lovely. She has such a charming personality, loves to follow me around when I'm cleaning pastures and is so easy to work with. Update: 6/14 ~ Vienna has grown into a beautiful young lady. she will be bred very soon and think she will make a wonderful mother. 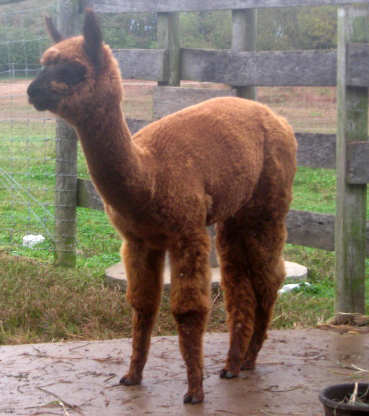 6/15 - Vienna was sold to a wonderful fiber farm in York, PA. She's enjoying life with a couple of donkeys and some exotic sheep. This little bugger gave us the most trouble this year. He just didn't want to come out. So with the help of Miss Linda, my 4H advisor, she was able to get him situated and ready to enter the world. In tribute to her, we wanted to name him the masculine version of Linda, and while Lyle really isn't it, it was as good as anything. Lyle is a sweet boy and he's easy to work with. I expect he will work well for one of our 4H'ers this year. Update 10/13 ~ Lyle has gone to a wonderful home and is currently being spoiled. We were starting to think that we might have to cancel our mid-July vacation because Moon just took so long to get here. Abby is known for going over a year with her pregnancies and this one was no different. Moon was well worth the wait. His spotless gray fleece is just beautiful and he is so sweet. He was the hardest one to wean and cried for mom for quite a while but he's doing well now and is growing nicely. 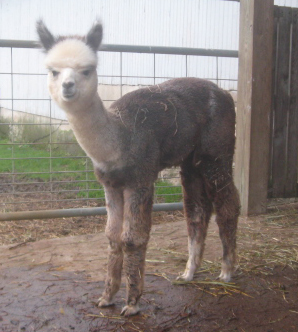 Update: 6/13 ~ Moon now lives on a farm in Southern York County with several other boys. I know he's being well taken care of and he is getting so BIG! As you can maybe guess from the name, we weren't entirely sure of who the daddy was. Sugar had been bred the summer before to our modern rose gray sire Harrison. But she was sending mixed signals when we tested her throughout the summer. Late in September 2011, we had a break-in with Eldorado. We knew he impregnated several girls but never gave much thought to Sugar since we suspected she was already pregnant. Well it turns out she was not. When we first saw this extremely dark baby, we just thought we had to have the dates wrong ~ he looked just like Harrison. So within weeks of his birth, we sent off his blood card just so we could see who the daddy was. As it turns out, Elde was the dad and where that color came from, we just don't know! As it turns out, he is absolutely the sweetest baby we had this year so we are so glad about this little oops! Update 6/14: Mystery Man is still one of my favorites even as he gets older. He's always there to offer a kiss and loves attention and is such a good boy. Update 5/16: It's rare that a 4 yo boy remains one of my favorites, but Mystery Man's gentle demeanor keeps him at the top of my heart. I was lucky and got to see this one being born. With just some minor help ~ her legs were tangled in the sack ~ Pia came out and was on the go faster than any cria I've ever seen. She, like her grandma Pink is a talker. She talks every time you touch her. She's very willing and interested in everything. Not only does she have beautiful fleece, but I think a 4Her will have a great time with her this coming year. Update 10/15: Tia had her very own baby. 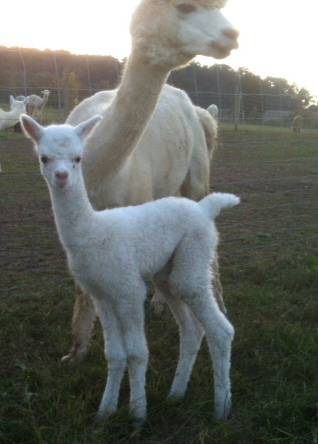 She's a fantastic mother and her cria Verano is just lovely. In this case, gray + gray = gray. We really like this little girl. Did I mention she is a GIRL! Tia wrapped up our year on a 50/50 girl/boy ratio which is pretty good for us. We plan to show this girl come spring. I just love having a new gray girl! Update 6/14: Tia is still on the small size at close to 2 years, so we will give her another year to grow before breeding her. She had a wonderful show career in obstacles and showmanship with Tanner. He did such a great job with her! 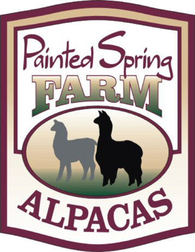 6/15 - Tia was sold to a wonderful fiber farm in York, PA. She's enjoying life with a couple of donkeys and some exotic sheep.